“School in sight. Kids in view. “Is the motto of the safety campaign for first-graders. Together with the association of the association Rheine, Rainer Trigger, headmaster Christophe Ames and the chairman of the association, Gabi Hochstetler, the board of the ADAC presented the yellow safety vests to the first graders of the elementary school in Oppenheim on behalf of the ADAC foundation. Wearing a safety vest gives children and parents extra security when, in the fall, many first graders master the way to school for the first time. But not only on the way to school should tighten the visually striking safety vest become a matter of course. It should always be part of their free time as well. 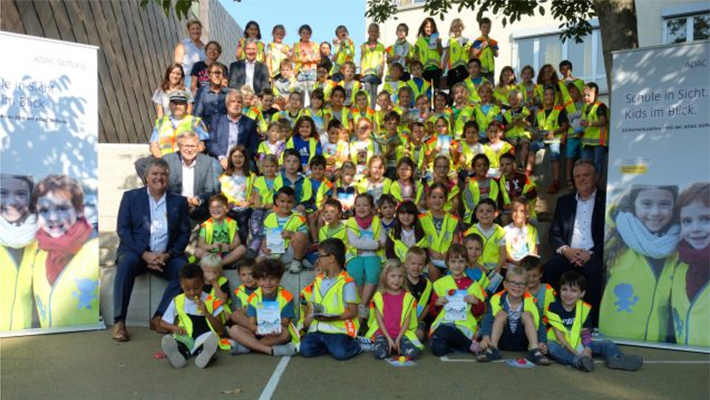 Experts assure that a safety vest with the reflective fabric significantly contributes to better visibility and first-graders are already seen from a distance of 140 meters in the dark. Elementary school students are not yet able to correctly assess the danger on the roads and because of their height, they often lack an overview. In addition, the directional hearing is not yet pronounced and the field of view is limited. So the children cannot always recognize approaching road users “out of the corner of their eyes”. The signal effect of the neon yellow safety vest with reflective material of the ADAC Foundation makes children visible from afar. That’s why it’s even more important for children to wear a safety vest.